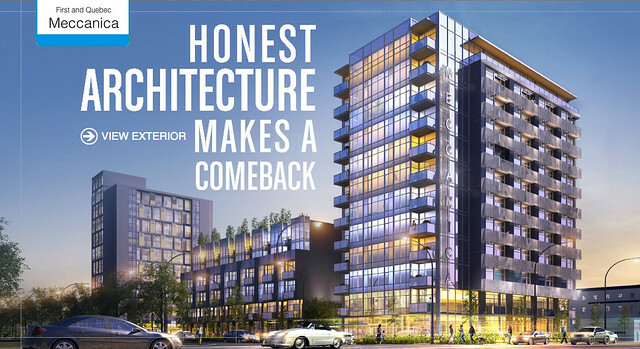 Here is an awesome new development by Cressey at the corner end of Southeast False Creek on 1st and Quebec: If you ask me this whole area is going through an amazing transition. No longer a fast food strip with McDs and Burger King; but instead all the big developers are jumping in and redefining the area. This central Main Street area will be unrecognisable in 3-4 years with much more density and a sense of life. Minutes to Downtown via Skytrain, bike, walk. We did a Realtor preview this afternoon and had a look at what they are launching and I would have to say that I like the direction this project is taking. A lot of the design elements are taken from the intermeccanica Roadster custom built on that same block the development is on. Concrete floors, A/C, retro Porsche colours, industrial hints, 9'4" ceilings, open floor plans, custom metal doors and much more. Maintenance fees are slated @ 0.35c a foot and the deposit structure can be found on the price range sheet below. Estimated completion fall of 2014. Floor plans are attached to the Preview Package below. Call either Marcus or Chris and we'll arrange a showing for you and get the inside track. Goes on Sale March 10, 2012.